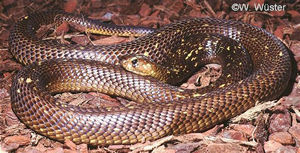 Medium to large, slightly depressed, tapered and moderately slender bodied snake with a medium length tail. Body compressed dorsoventrally and sub-cylindrical posteriorly. Has long cervical ribs capable of expansion to form a hood when threatened. 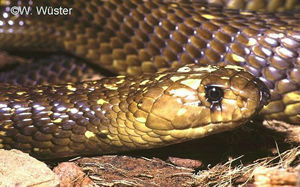 Can grow to a maximum of about 1.81 metres. Head broad, flattened and slightly distinct from neck. Canthus is distinct. Snout is rounded. Eyes are medium in size with round pupils. Dorsal scales are smooth and strongly oblique. Dorsal scale count ( 19 to 25 ) - 21 ( 19 or 23 ) - 15 ( 13 or 17 ). Temperate regions, arid karroid regions, particularly along rivers and streams entering well drained open areas. Non spitter, diurnal, active during the day and late evening. It will climb small trees and bushes. If confronted it will raise its forebody and spread its hood tending to dispute its right of way, rather than flee. Frequently makes its home in farm house foundations and stone walls. 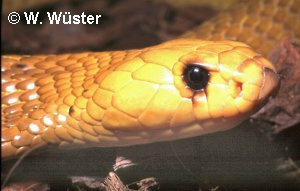 Feeds on a wide variety of small vertebrates, including other snakes. Particularly common around Karoo farms where small rodents are plentiful. Known to frequently raid weaver colonies. 100 to 150 mg ( dry weight ), Minton (1974) ( Ref : R000504 ).